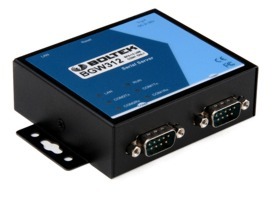 The EFA-20 USB to Fiber Optic Converter allows you to connect an EFM directly to your computer’s USB port without the inconvenience of first converting to RS-232 (with the EFA-10). 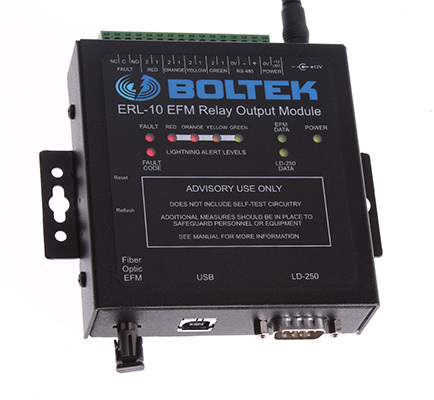 The ERL-10 Lightning Relay Module for the EFM-100 provides timed relay outputs for up to 3 lightning alarm ranges. Click here for the ERL-10 Data Sheet. See the Accessories Page to order. The EFM-100 Inverted Mounting Kit is now available in either 2 foot tripod, 3 foot tripod or pole mount versions. See the Inverted Pole Mounting Kit page for details. See the BGW312 web page for more information. 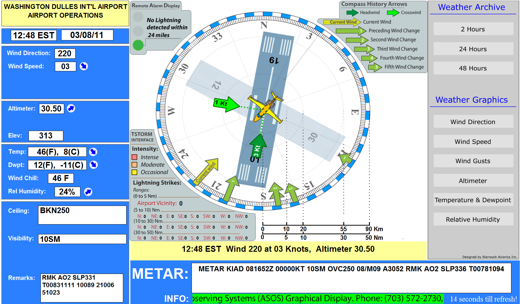 Stanwyck Avionics Inc has developed the SAI AWOS/ASOS Graphical Display Software for airports. 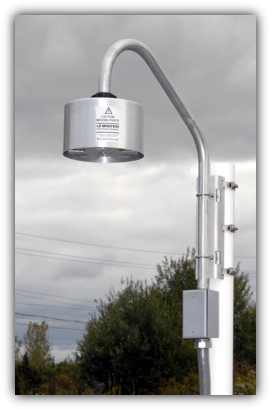 Their software accepts data from the Boltek LD-250 Lightning Detection System and Boltek EFM-100 Atmospheric Electric Field Monitor to provide lightning advisories to airports across America. Click here for live data from the Washington Dulles International Airport (IAD). Press F11 to toggle full-screen display. The LD-250M is a ruggedized version of our popular LD-250 Lightning Detector. Fully IP67 compliant, with MIL spec connectors it is optimized for situations where a lightning detector needs to be repeatedly deployed or where the environment can be unfriendly to unprotected electronics. Basic installation instructions for the lightning sensor are printed on the top of the unit to aid in deployment for those unfamiliar with the system. 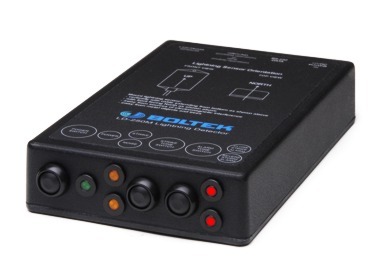 The LD-250M is functionally identical to Boltek’s LD-250 Lightning Detector. Contact Boltek for more information. 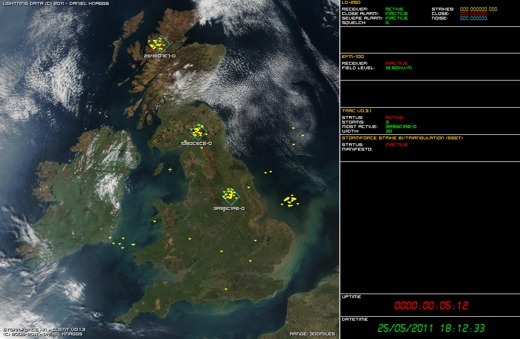 Updated StormTracker/LTS-2 Developers Toolkit software is now available for customers interested in developing their own software for the Boltek StormTracker Lightning Detector and LTS-2 Timestamp kit. This version adds support for the StormTracker PCI Driver (64 bit). The StormTracker/LTS-2 Developers Kit software can be downloaded from the Downloads page.